Piedmont agent Heather Hudson shared her powerful personal story of how the American Airlines-owned subsidiary is paying its workers poverty wages at a town hall event hosted by Sen. Bernie Sanders (I-Vt.) on Monday in Washington, D.C.
"When I started at American's Piedmont Airlines in Charlotte, N.C., over 10 years ago, I earned less than $8 an hour," said Hudson at the event which was live streamed to over a million viewers on Facebook, Twitter, and YouTube. "My current salary, after a decade of working for Piedmont, is now less than $14.50 an hour. I cannot make ends meet without working extra hours. I work 12-hour days, but even with this additional time, I still qualify for Medicaid and food stamps and have been receiving that support for the past five years." Hudson pointed out that the starting wage at Piedmont Airlines is still only $8.50 an hour, and that many of her coworkers are working double shifts every single day or working second jobs at fast food restaurants just to make ends meet. "This is what it's all about," Sanders said, responding to Hudson's story. "Somebody who works hard at a stressful job, year after year after year, and you and your coworkers have to walk into offices to get food stamps because the company that made $1.9 billion last year apparently doesn't have enough money to pay you and your colleagues a living wage. That is an outrage." Workers from Amazon, Disney, McDonald's, and Walmart also participated in the town hall. Sanders invited CEOs from those corporations to attend as well but they chose not to. 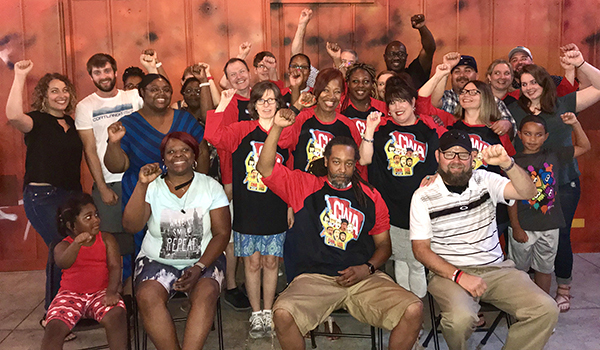 CWA members at American's Piedmont Airlines and Envoy Air subsidiaries are fighting for fair contracts and living wages for passenger service workers. Check out highlights of Hudson's remarks here and the full event here. 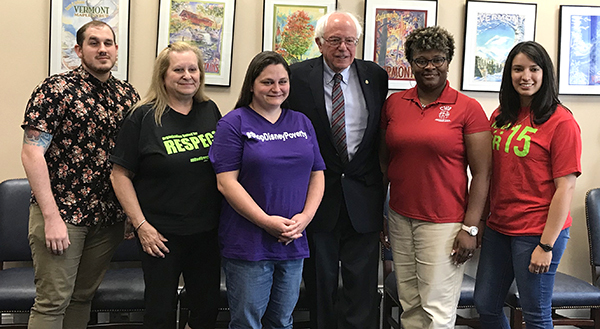 Piedmont agent Heather Hudson (second from right) was featured at a town hall event hosted by Sen. Bernie Sanders (I-Vt.) on Monday in Washington, D.C., along with workers from Amazon, Disney, McDonald's, and Walmart. Two years ago, Verizon East workers walked off the job to demand a fair contract after more than ten months of negotiations. Now, CWA members have built on those gains with a tentative agreement on a four-year extension of the current contract, which was set to expire in August 2019. The new agreement extends the contract through August 5, 2023, delivering an 11.2% wage increase and other improvements over the additional four years. 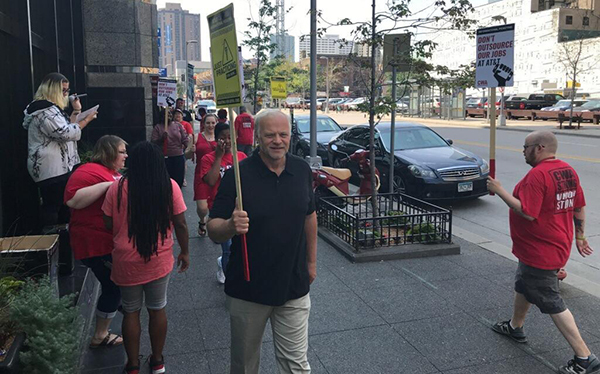 "Verizon approached CWA earlier this summer to propose early negotiations to extend the current contract," said District 2-13 Vice President Ed Mooney. "We saw this as an opportunity to make improvements for our members without the lengthy conflict we experienced two years ago. This is a solid agreement that will improve the living standards of our members across the region." A separate agreement with improvements in scheduling, wages, grievance procedure, and much more was reached covering 40 Verizon Wireless retail workers in Brooklyn, as well as seven workers in Hazleton, Pa., who voted just last week to join CWA. CWA members will vote on ratification of the tentative agreement over the next few weeks. Last week, the CWA bargaining team reached a tentative agreement with Frontier Communications to extend the 2016 Collective Bargaining Agreements for CWA-represented Frontier employees in California. The members will be given the opportunity to vote to ratify the contract extension, which provides CWA members with job security, increased wages, and no increased costs for medical premium insurance through September of 2020. Learn more about the tentative agreement here. In the face of AT&T's unwillingness to make serious progress toward keeping good jobs with family-supporting wages and benefits in their communities, CWA members at AT&T Midwest and AT&T Legacy T are ramping up mobilizations and working to increase political and public pressure on AT&T to bargain fair contracts. NABET-CWA Local 57411 joined an AT&T picket line in Minneapolis, Minn., to show their solidarity with the workers fighting for a fair contract. Last week, workers at the Verizon Wireless retail store in Hazleton, Pa., voted to join together in a union. Seven workers at the location will be represented by CWA. "Through a union, we'll be able to stand together for good, family supporting jobs at our store," said Thomas Leshko, a four-year employee at Verizon Wireless. "Verizon is enjoying huge profits and a big tax break. Now it's time for the company to invest in Pennsylvania workers and customers." "These new CWA members are sending a strong message to Verizon," said CWA Local 13000 President James Gardler. "Wireless workers are a critical part of the company. They deserve respect and are ready to fight for it." A growing network of Verizon Wireless workers are joining together to win job security and improvements at work. The group in Hazleton found support from workers in area union-represented AT&T Mobility stores, who met with them to talk about the importance of having a voice on the job. CWA members across New York have been working with other unions and allies to pass the life-saving Safe Staffing for Quality Care Act to set a safe limit on the number of patients nurses can be assigned. Members from CWA Local 1111 held a rally this week in Elmira, N.Y., advocating for the bill, which would require all acute care facilities to meet minimum nurse-to-patient ratios, and would require all residential healthcare facilities to comply with minimum care hours for registered nurses, licensed practical nurses, and certified nurses aids. "Anyone who has gone to the hospital can see how the shortage affects care. There needs to be a ratio of nurses to patients for safety reasons," said CWA Local 1111 President Jake Lake. Members of CWA Local 1111 held a rally this week in Elmira, N.Y., to call on the New York legislature to pass the life-saving Safe Staffing for Quality Care Act. Corporations like Wells Fargo are pocketing massive, permanent tax breaks from the Republican corporate tax cut bill and enriching CEOs and wealthy shareholders through stock buybacks — while lowering workers' wages and cutting jobs. Senator Tammy Baldwin (D-Wisc.) has introduced the Reward Work Act, supported by CWA, which would prohibit many of these buybacks that are harming working families. 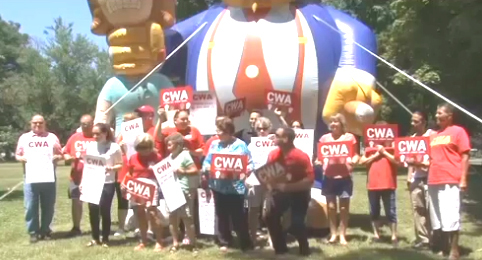 Watch and share Baldwin's video featuring Wisconsin CWA members here. The Customer Service Political Engagement Program, a pilot program in North Carolina developing customer service members into activists who are armed with political education, leadership development, and action plans to build worker power, just graduated 13 activists from CWA's Political Activist Training. Participants included AT&T and American Airlines call center members from CWA Locals 3603, 3607, 3640, and 3642. Participants completed CWA's two-day political bootcamp and a six-week follow-up political education and leadership development program, and plan to create the first ever statewide customer service committee in North Carolina focusing on engaging customer service members in political, legislative, and organizing fights in the state. The work is supported by CWA's Customer Service Growth Fund and the CWA Political Department Growth Fund. Participants from CWA Locals 3603, 3607, 3640, and 3642 completed a two-day political bootcamp in North Carolina. The federal government must establish protections for workers who are subject to extreme heat, said CWA, along with more than 130 organizations, this week in a petition to the U.S. Occupational Safety and Health Administration (OSHA). The filing of the petition marks the launch of a national campaign to raise awareness around the effects of climate change on the health and safety of workers, and to advance standards to prevent injuries and deaths from outdoor and indoor heat stress by instituting mandatory rest breaks, hydration, and access to cool spaces. During a telephone press conference to unveil the urgent call for action, CWA Local 6210 member Beau Easter, an AT&T Premises Technician in McKinney, Texas, shared the story of how he acted last year to save a fellow CWA member's life just days after he had participated in a crucial CWA safety training on heat illness prevention – an incident that could have been easily prevented by having and enforcing strong heat protection standards for workers. CWA has been a leader among labor organizations in promoting and establishing heat stress materials; conducting member heat stress education programs; bargaining with key employers to ensure members are provided heat stress protections; and working with OSHA, other unions, and public health organizations to establish a federal heat stress standard. CWA continues to remain active and vigilant towards preventing member heat stress health problems. This week, FCC Chairman Ajit Pai expressed "serious concerns," about the potential Sinclair-Tribune merger, joining a chorus of broad public opposition including thousands of CWA members who submitted comments to the FCC opposing the job-killing deal. Sinclair has a long history of cutting jobs when it acquires stations, which means more pre-packaged segments and cookie-cutter scripts and less local news coverage that reflects the concerns and interests of the communities that these stations serve. After Pai's comments this week, CWA called for the idea of the merger to be abandoned. CWA members are fighting to save the University of Iowa Labor Center after University of Iowa Law School Dean Kevin Washburn announced his plan to close the Center within the next year. The Labor Center has provided education and research support to working people in Iowa since 1951 on essential topics such as workplace safety, legal rights regarding sexual harassment and discrimination on the job, wage payment rights, and leadership skills. In a written testimonial, CWA Local 7012 retiree Kerry Bowen noted that attending a training at the Labor Center gave her "the confidence to be secretary of the Polk County Democrats, recording secretary of South Central Federation Of Labor, and appointed by my local mayor to be a commissioner on the DM Greater Sister Cities Commission…The Labor Center unleashed me to soar." "This is an inexcusable decision by the university that will harm Iowa working families," said CWA District 7 Vice President Brenda Roberts. "Iowa CWA members will be on the front lines fighting to save the Labor Center to ensure that working people continue to have access to invaluable information about their rights at work."